A great cartoonist takes on the IRS!!!! 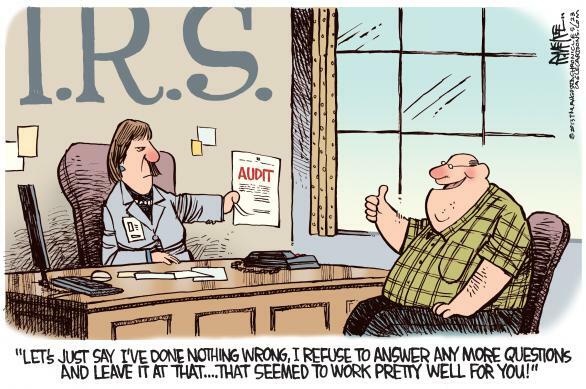 A great cartoonist takes on the IRS!!!! Why do people in the IRS think they could take the 5th when the IRS would not be happy with that answer from a taxpayer? Notwithstanding the title of this post, this is not a story about a taxpayer fighting against the IRS. If you want that kind of story (and if you have a strong stomach), you can read about how an IRS thug named Robert Norlander tried to ruin the life of a guy named Charlie Engle. Or, on a lighter note, you can read about Evan Mathis and his “encounter” with the IRS. But that’s not today’s topic either. Instead, we’re introducing a new political cartoonist named Jim McKee, who came to my attention when a reader recommended his work in the comment section of a post featuring about 10 other cartoons about the IRS scandal. As you can see from these cartoons, I’m very happy to be introduced to Jim McKee, particularly since he’s generating some great material about the IRS scandal. Let’s start with a cartoon he produced that calls attention to the fact that an IRS hack pleaded the fifth even though taxpayers don’t have similar rights when confronted by tax collectors. And here’s another good one, which reminds me of the Glenn Foden cartoon in this post. By the way, the IRS actually is concerned about its image. This is the bureaucracy, after all, that decided to squander $15 million of our money on a PR campaign. Anyhow, McKee has given us some very amusing cartoons. But let’s not lose sight of the fact that we have a terrible tax code, which is enforced by some terrible people. The politicians deserve most of the blame, but you can see from these examples that the IRS bureaucracy deserves scorn. 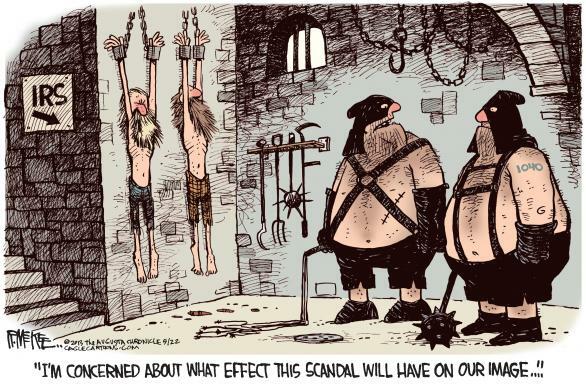 Cartoonists show how stupid the IRS is acting!!! Obama jokes about audit of Ohio St by IRS then IRS scandal breaks!!!! !